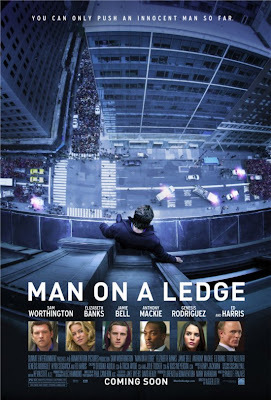 Another runner-up on my list for this year, Man on a Ledge was better than expected. It certainly deserved more of a shot from audiences than it got. It's a really good thriller that may not have you guessing what's going to happen next, but will definitely keep you glued to the screen to see how the whole heist plays out. The story involves Nick Cassidy, a man who in his mind was wrongfully imprisoned for stealing a diamond he claims he never stole. So he hatches a plan with his brother to break out of jail and pose as a suicide threat to distract the diamond owner (played by the always reliable bad guy actor, Ed Harris) so Nick's brother can steal the diamond for real. It sounds a bit convoluted and the story does take time to come into focus but after a half an hour, you'll be anxiously waiting for the other shoe to drop. I wouldn't say it's a masterful thriller, but it's decent and there's some good performances from Worthington and Banks. The latter playing the negotiator who is trying to get Nick off the ledge. She has her own issues to deal with and although it's not a terribly done side plot, it's not really a huge distraction from the main plot either. There a couple of very small twists near the end that wrap up all the loose ends that felt a little forced, but I was too involved with the outcome of the movie that I didn't mind some of the confusion. If you like thrillers, this one a great rainy day movie - you may not be guessing how it will end, but there's enough suspense and drama to keep you entertained as to how the movie gets to the ending. 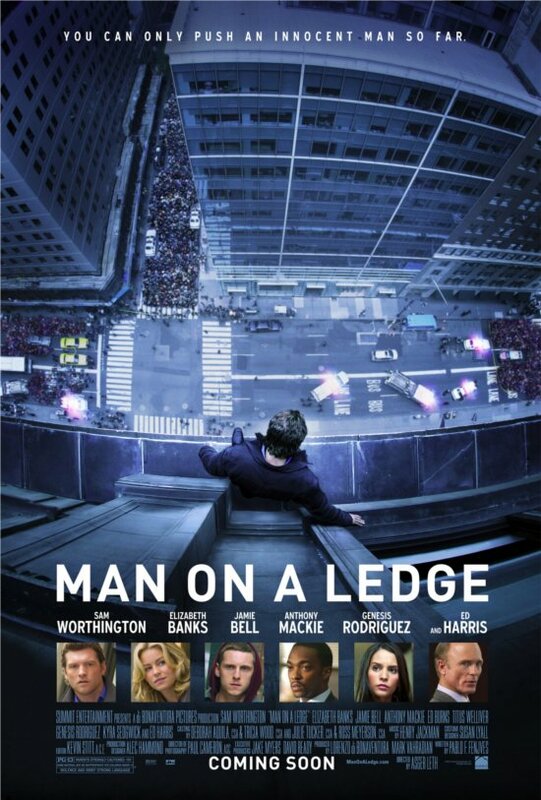 I would compare this movie to Inside Man - although not as amazing - it certainly holds its own in this genre. You might be asking yourself, "When did this come out?" Well, this movie got dumped onto the screens in late February to take advantage of that time of year when no one goes to the theater. I'm pretty sure the studio decided that they might get a chance at making back half the budget because they had a relatively big name in the lead role. 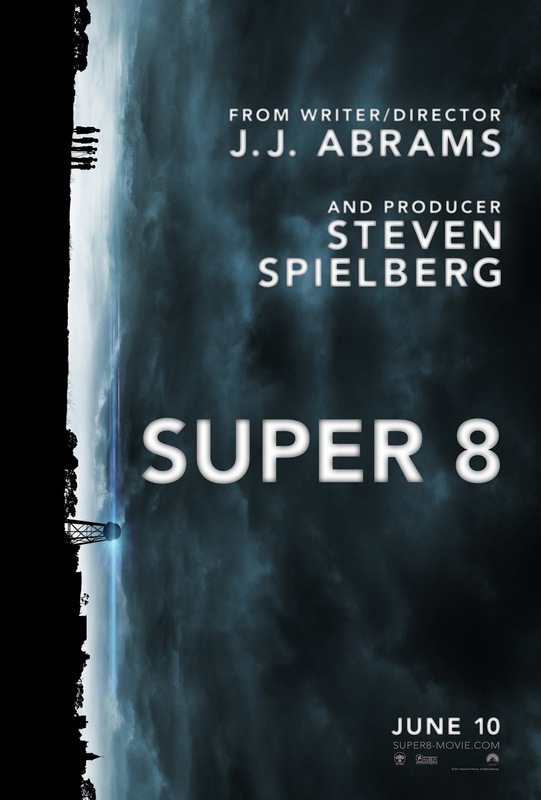 I know I put this in the runner-up category for Most Anticipated and I was really, really hoping this might be one of those movies where it would surprise me at how good it was. But alas, it's a dreadful film - one that could have been released on the Lifetime Movie Network and probably would have bit the dust there as well. The film follows Jill, a lonely waitress who lives with her sister after being found covered in mud coming out of the Northwestern wilderness claiming she was abducted by a serial killer who threw her into a hole in the middle of the forest. But somehow she managed to overpower a man twice her size and get away. The police think she's a looney because there's absolutely zero evidence to back up her claims, but when her sister goes missing, it's up to Jill to save the day and face her past. SPOILER ALERT! So I was really hoping that this would turn into a psychological thriller - and for the first half of the movie they lead you to believe she's just crazy - but then the movie takes a wrong turn into boredomville. Once you find out that the killer is real and is just trying to finish the job he couldn't do a year ago, well it's all just a really long 45 minutes to the end of the movie. It could have ended up being a really good girl-gone-crazy movie with a couple of nice twists, but you spend the second half of the much yawning. And on top of that, the serial killer is just some dude who is really, really bad at his hobby. Apparently he's been killing lots of girls but I don't believe it because he let Jill get away twice! I don't know how he set up this elaborate scheme to get her back into the wood to kill her and then basically goof it up by leaving her in the hole with a gun! The killer is not unmemorable - he's supposed to be this psycho who lives in the woods but you don't even really get to see his face all that well. What could have been something more sinister ends up being really laughable when Jill shoots the guy and leaves him to burn in the hole he created. Sheesh! It was the dumbest ending I've seen in a while! END OF SPOILERS! I would have loved to see this be more of a psychological thriller, but it's not. The movie is dull and even the cast seems to know this - they're all just collecting a paycheck it seems. And talk about ruining a setting! The Pacific Northwest is a perfect setting for this kind of thriller (see the FX show The Killing as a great example), but they seem to have forgotten that being in the woods after dark should be scary. The movie wants to claim that it's suspenseful and thrilling, but by the end your left questioning, "That's it?" I movie had potential - I really like Seyfried and I hope she has a long career, but this one you'll see in the dump bin at the local Big Lots next year. Stay away from this stinker. Number 18 on my list last year - this movie was so, so much better than I had anticipated. It had a magic feeling that was absent in movies like Hugo and The Adventures of Tintin. I loved everything about this movie - it had the right atmosphere of mystery and action, the cast was strong and the dialogue was witty and fun. It's a great story that feels so much like a Spielberg movie before he got obsessed with World War 2. For those put off by the sci-fi story, it's just a backdrop to a great coming-of-age story. I keep coming back to the word magic when I describe this movie to people and it's true - it puts a spell on you and leaves you feeling happy. I loved how the movie was set during the early 80s - it plays into the nostalgia of that era and what Speilberg was doing back then, too. The cast is really great in this one, too! Joel Courtney, a relative newcomer, is brilliant as the main character who has a crush on Elle Fanning's character. She's also great but what made the movie even better was the addition of Kyle Chandler. Better known as Coach Taylor from Friday Night Lights, he knows how to play a dad. And this role was perfect for him. 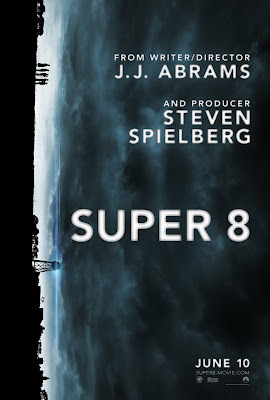 It's a sweet and charming story - but Abrams isn't afraid to throw action into the mix when the monster gets more involved in the story. The best parts of the movie are when all the kids are hanging out together. For me, it brings back memories of being a kid. The fact that the setting is a small Ohio town makes me love this movie even more - it's a powerful effect for me personally. I loved every minute of this movie and can't wait to go back and enjoy it over and over. It's a special movie that I think will stand the test of time! It's actually sad for the Academy when the Golden Globes are getting better at selecting the years best, but we can only hope that they start recruiting people younger than 60 in the actual industry to vote! In my opinion, this next movie was one of the year's biggest snubs. Based on 1974 crime novel, the film follows Pitt, a professional hitman as he investigates a heist that goes down during a mob-guarded high-stakes poker game. It's supposed to be a brilliant novel and I like the idea of this mob movie that's told from somewhat of an outsider. 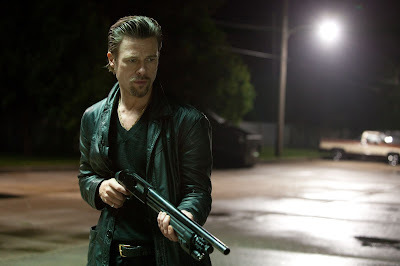 Pretty much anything Pitt's involved with I will check out, even if crime isn't my favorite genre. Plus, I loved Dominik's last directorial effort, The Assassination of Jesse James by the Coward Robert Ford. A lot of people called that movie slow and dull, but I thought it was thrilling and a great character study of the real wild west. So count me in for this one! Now on to the top three of 2011! I know it's the end of March, but I'm finishing this list, dammit! I've watched all the Oscar nominees and aside from Moneyball and The Descendants, I just don't know what all those stuffy old white men were thinking. Oh well, I think 2012 is going to be a great year for big time blockbuster movies, but may be lacking in really serious, Oscar-worthy fare. Although it's really too early to tell what's going to come out in the fall, I'm pretty sure my list next year will be wildly different from the Academy's. But it's always nice to have a surprise come along every once in a while. A movie that was never on your radar, but you gave it a shot and it turned out to be one of your favorites. It's happened with Once Upon a Time in the West for me and it happened last year when I decided to watch Mike Mills' second movie, Beginners.